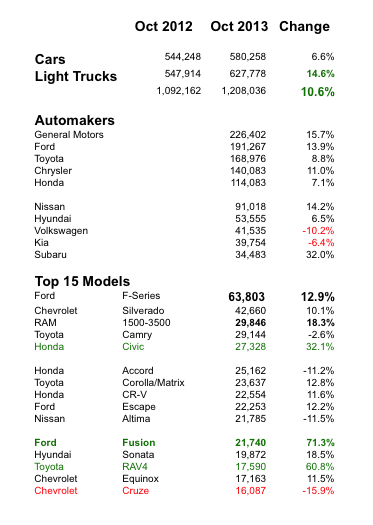 Three of the top five automakers increased sales in double-digits in October. “General Motors, the nation’s largest automaker, led the way with sales up 16% to 226,402.”[ii] Ford sales were also strong, up nearly 14% due to good sales of its F-Series trucks. GM’s Silverado models were up 10% in October. And, Chrysler’s 11% gain was to a large extent due to its 18% increase in RAM trucks (Table 1). Among the top models, the Ford Fusion saw the biggest percentage gain at 71.3%, to 21,740 units (pictured below). The second largest gain was made by Toyota’s RAV4 with a 60.8% increase. 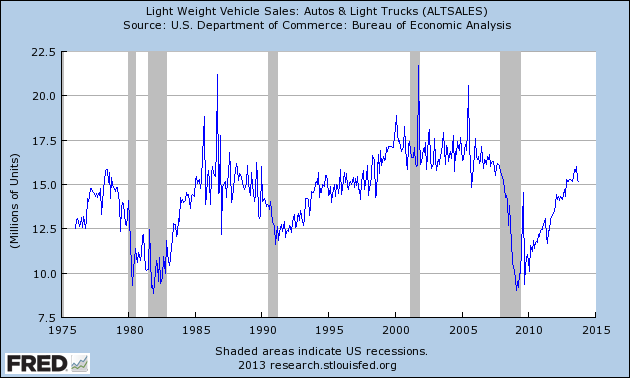 Utah car and truck sales usually follow national trends. First half sales of Utah cars and light trucks were at 53,173, up 12.3% from 2012. [i] Big Gains for Auto Sales Despite a Government Pothole, New York Times, B2, November 2, 2013.